Las Vegas-based Naqvi Injury Law has begun a multi-year pledge commitment in support of the mission of Cure 4 the Kids Foundation and its pediatric outpatient treatment center. The clinic is Nevada's only outpatient center focused on the treatment of children diagnosed with cancer and other catastrophic conditions. 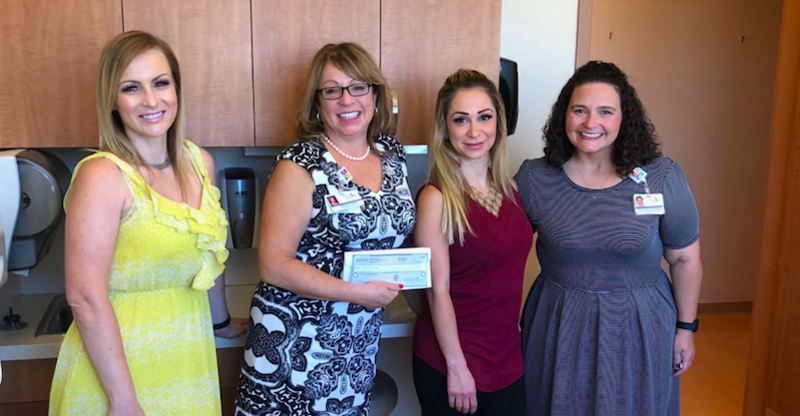 Pictured: (L to R) Jenae Page, office manager, Naqvi Injury Law; Annette Logan-Parker, president & CEO, Cure 4 the Kids Foundation, Ellie Naqvi, legal administrator, Naqvi Injury Law; Dawn Marie Bernhard, director of business development, Cure 4 the Kids Foundation. LAS VEGAS – July 3, 2018 – Cure 4 the Kids Foundation is proud to announce that Las Vegas-based Naqvi Injury Law has begun a multi-year pledge commitment to help further the mission of the nonprofit organization, and its pediatric outpatient treatment center. As the only outpatient facility in the State of Nevada focused on the diagnosis, treatment and long-term health of children affected by cancer, the multi-year donations are vitally important to Cure 4 the Kids Foundation and its efforts to meet the healthcare needs of patients — including those with insurance and without. In recognition of the financial support, an examination room will be named in honor of the Naqvi family at Cure 4 the Kids Foundation’s new facility on the third floor of One Breakthrough Way in Las Vegas, near Town Center and the 215 Freeway. Later this year, Cure 4 the Kids Foundation will move all clinic and administrative operations into the new facility on the Summerlin campus of Roseman University of Health Sciences. Farhan Naqvi founded Naqvi Injury Law in Las Vegas in 2008. The personal injury law firm made the financial commitment to Cure 4 the Kids Foundation knowing how difficult catastrophic medical conditions are on young patients, as well as their families. The donations will be used to address critical needs within the organization and clinic, including support of the Charity Care Program. It ensures that patients without medical insurance or those unable to pay for services still receive treatment. To date, more than 500 families have relied on the Charity Care Program to get the life-saving treatment their child needs. Since its founding in 2007, nearly 40,000 patients have been treated by medical staff at Cure 4 the Kids Foundation. The majority of those cases were for treatment of childhood cancer. Naqvi Injury Law was founded in 2008 by Farhan Naqvi, an award-winning personal injury attorney. Over the course of his career, Naqvi has obtained millions of dollars in compensation for his clients. In recognition of his efforts on his clients’ behalf, Naqvi is a member of the Million Dollar Advocates Forum, has received the highest possible rating of AV Preeminent from Martindale Hubbell, and holds an Avvo “Superb” rating. In 2017, the firm was voted #1 Law Firm, #1 Personal Injury Firm and #1 in Customer Service in the Las Vegas Review Journal’s Best of Las Vegas program. Naqvi Injury Law was the only Nevada law firm listed in the Inc 5000 in 2016.